Sometimes… the Snow Gods Deliver! If you follow us on Facebook or Instagram there’s a good chance you’ve already seen the photos and video from our recent ski trip to Manning Park Ski Resort, located in the heart of the Cascade Mountains. Spoiler alert – it was epic! If you’re more of a visual person (who isn’t these days? ), you’ll want to check out the video below to see the unbelievable powder conditions we received. We spent 3 days on the mountain. The footage below was captured on the afternoon of Day 2 and the morning of Day 3. If you’re attention span is too short, fast forward to 1:33 to get to the really good stuff. Having trouble viewing? Watch directly on YouTube here. We deliberately booked this trip over the Easter holiday weekend, which was the first weekend in April this year. We did this for two reasons – (1) we wanted to maximize our vacation time by taking advantage of the statutory holiday (this is one of the ways we’re able to travel more often), and (2) we wanted the weather to be warm and sunny because our boys hate the cold and we wanted them to enjoy skiing. We thought the beginning of April would deliver warm spring skiing conditions. We envisioned a few easy cruisers down the hill, followed by a few cold beers at a picnic table. This was the case on our first day at the mountain. It was warm and sunny. The runs were groomed and soft packed. It was a fun day on the mountain, but nothing special. I was watching the weather forecast and it said the region could receive up to 10 cm of snow on the Sunday. We crossed our fingers and hoped we’d get at least a light dusting of snow. We got over 30 cm’s of fresh snow over a 24 hour period! And if that wasn’t enough – we had the entire mountain to ourselves. It felt like we were the only ones on the mountain. I think the longest line at the chair lift was 6 people. This was our first time visiting Manning Park Resort in the winter. We spent a few days at Manning Park in the autumn a couple years ago (read about that trip here) and it’s been on our radar ever since. We have a life goal to visit every ski resort in British Columbia, so this trip to Manning Park got us one step closer. Below are a few photos from our time snowboarding at Manning Park Ski Resort. I attached our new GoPro Hero 6 on my helmet to capture the photos and video. We put Braydon in ski lessons for this trip to Manning Park Resort. We don’t ski, we snowboard, so we want our boys to learn how to ski properly. The first time Braydon put on a pair of skis was two years ago at Sun Peaks Resort (read about that experience here). Since then, he’s taken a few ski lessons at Mount Seymour in Vancouver, but he had never gone up a chair lift before. That is, until this ski trip. We were a little worried when Braydon’s ski instructor said he would be taking him up the chair lift. We didn’t think he was ready. We thought the run would be too long and steep for him. We didn’t want to push him too hard. Good thing we weren’t teaching him to ski – he was so ready to take his skiing to the next level! After his ski lessons we took him up the chair lift and went skiing with him for the very first time. He completely blew our minds! We had no idea he would catch on so quickly. He left this trip feeling very good about himself and he’s already talking about next year. Having trouble viewing? Watch directly on Facebook. These photos were captured after his first lesson, before the snow hit. He fell quite a few times and each time he smiled and bounced right back. Hard to tell with his mittens, but he’s giving skiing a big thumbs up. Connor’s first ski lessons were a success! It could have gone either way. Connor can be a wild card when it comes to trying new things for the first time. Sometimes he jumps right in and loves it. Other times he has a complete meltdown. We were hopeful he would take to skiing, but we feared he would resist and shutdown. There were a few moments during his lesson when he was close to giving up, but he pushed through his fears and walked away feeling good about skiing. Hopefully this trend continues next year. Manning Park Ski Resort is located inside E.C. Manning Provincial Park in the Cascade Mountains. It’s about a 3 hour drive east of Vancouver. There are no accommodations at the ski hill. If you want to stay close to the ski hill, the only place to stay is at Manning Park Resort, which is a 15 minute drive to the ski area. The hotel provides free shuttle service to the ski hill during ski season. It’s a small resort but there are plenty of accommodation options. We stayed in a Mini-Suite inside the main hotel. It was a spacious room with two queen beds, pull-out sofa and kitchenette. You can also rent private cabins and chalets. These cabins are popular in both summer and winter, so you’ll need to reserve well in advance. 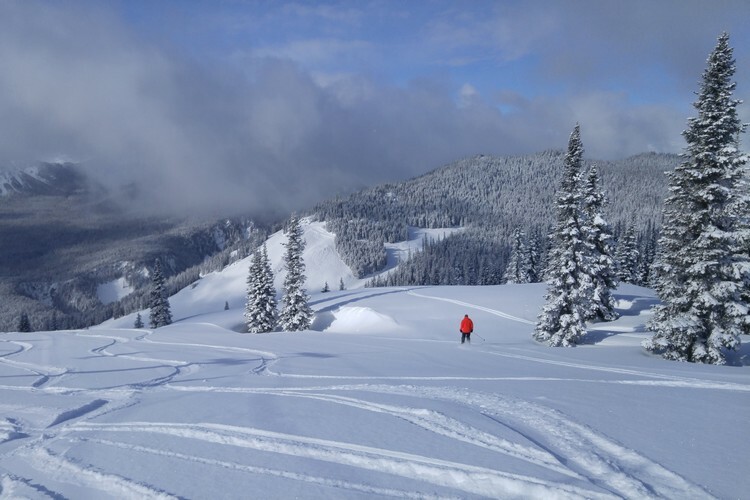 There is no cell phone reception at Manning Park Resort or the ski area. You won’t be able to communicate as you normally would, so it’s best to have a game plan. There are limited fuel stations and grocery stores near Manning Park Resort, so it’s best to fill up your tank and get supplies in either Chilliwack or Hope. There is a small restaurant and pub at the resort. We dined at the restaurant every evening. The food is good and prices are reasonable. More info on ski passes, lessons and hours of operation can be found here. What a great weekend for skiing! We started my son skiing in Vermont when he was 7 and we had no idea that he would grow up to be obsessed over it. He moved to Colorado to ski as much as possible, buys the epic ski pass and spends every weekend from November to May – as long as conditions allow – skiing. And to think that he complained about the cold the first time we took him. Who knew? What an incredible place to enjoy with family. I really want to ski, but I do not have the courage yet. Looks fun guys! Good for Braydon; always awesome to get back up after you have fallen. We learn much from kids. As for the resort, wonderful. Quite a bit of snow in a 24 hour stretch but perfect for skiing. I’ve not hit the slopes yet but have this place in mind. Feels enchanting to me. Thanks for sharing!